I am sure everyone remembers this Lady Gaga cover of Vanity Fair. I was obsessing over her nail polish quite some time ago. I found out it was Waking Up in Vegas by Deborah Lippmann. It had been out of stock for quite some time and when I heard they were having a 20% off sale and I saw this color was in stock I jumped at it right away! And I am SO glad I did! I have not taken this color off in over a week and for me that is huge. I usually change my nail polish every 2 days! The color is captivating, its very neutral but there is a je ne sais quoi about it... its not quite grey and its definitley not taupe. It is a mix but more grey with a beige mixed in and creamy looking. Chin-chilly by Essie is close but darker and browner. Let me tell you about the formula. Perfection! Creamy, One coat and completely opaque. Not streaky, not too thin and not too thick. I am in LOVE. Excuse the grainy shot, I had my J.Crew fingerless gloves on and I was waiting for my elevator to come! 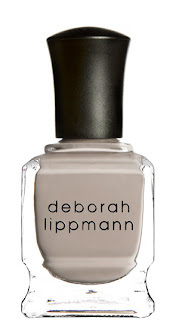 You can buy this polish here at Deborah Lippmann! I highly recommend you love a grey/ taupe color. Aw it looks absolutely amazing, i have on the prowl from MAC but its meh..this one looks stunning. I also love this kind of grey/lilac hair colour. Picking it up today! Been wearing Chanel Riva which after the necessary four coats of polish is DIVINE! Ahh this color is friggin gorgeous! Wish I got it in the sale. omgoodness, this is beautifullll! I love it! Fine write-up! I at this moment turned cognizant of your web blog by using chiropractic heath care treatment in combination with were required to lay claim That I involve appreciated reviewing your web blog posts. After all this mouse click listed here usacheckcashingstore.com/costa-mesa Great give, astonishingly useful. فكر في ما هو أفضل من أجل رفاهية أثاثك الثمين من ناحية ، والأفضل من أجل سلامتك وسلامة عائلتك. إذا لم يكن بإمكانك على ما يبدو استئجار خدمات شركة نقل محترفة ، فعليك التأكد من أنك ستتمكن من الحصول على القوى البشرية الكافية من دائرة أصدقائك. أولويتك القصوى ، بالطبع ، هي طلب هذه المساعدة الودية التي لا تقدر بثمن مقدمًا حتى لا تتعطل خطط أصدقائك.